Safe and secure laser treatment. 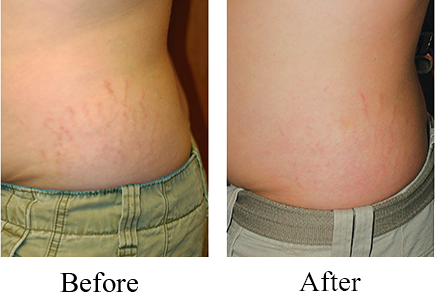 Customized treatment for various stretch marks before and after skin wash in Westbury. Laser 'n' Beyond laser system a proven, successful method for reducing the appearance of hyperpigmented scars, including new stretch marks. This procedure can achieve satisfying outcomes on stretch marks that are still reddish,purplish or darker colored than the rest of the skin. This non-invasive, gentle approach uses targeted flashes of light to treat dilated and broken blood vessels without injuring the surrounding healthy skin. 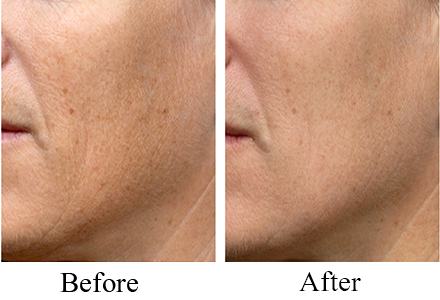 The laser’s energy selectively alters damaged skin areas while at the same time stimulates the cells under the stretch mark to cause the formation of new collagen. Slow, progressive improvement in the texture, color and irregularity of stretch marks rather than complete elimination is the main goal of laser treatment. Typically, a series of six sessions is recommended, scheduled at three-week intervals. Each session usually lasts about 20 minutes, with patients returning to normal activity immediately. By dividing the full program into several sessions, laser treatments provide gradual, natural improvement with excellent long term results.